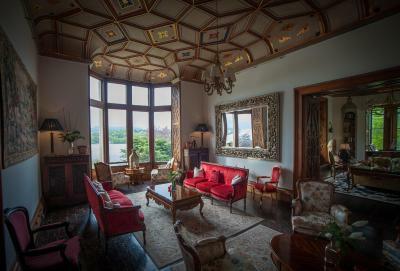 Lock in a great price for Château Rhianfa – rated 8.9 by recent guests! The friendly staff, views, the fabulous interior and exterior, the garden, the proximity to the coast, the general ambience, the way there is something unusual and special around every corner. It's just incredible . The building was fabulous and well preserved. 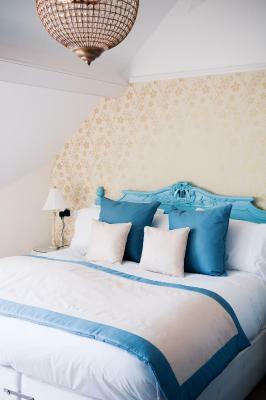 The staff were extremely welcoming and the rooms were spotless. The breakfast was everything you would expect from such a high standard hotel and there was plenty of choice. Complimentary water was an added bonus and much appreciated. An impressive setting and the building is a marvel. 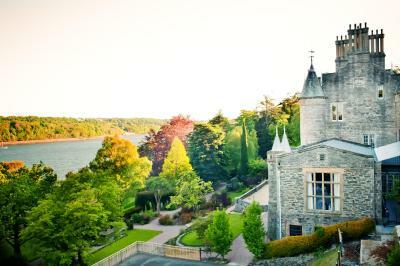 The views of the Chateau, the gardens, and the Menai Strait are all remarkable. I had a first-rate meal for dinner the one night we ate at the Chateau, and the breakfast staff was also friendly and helpful. 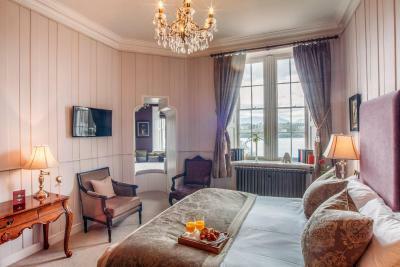 Room was okay (The Bangor suite no. 6), with a nice view up the strait. It wasn’t easy to get to (many flights of stairs, an awkward three-step entrance up to the door, and the lift was not offered). Also, the impressive turret-room shower needs some non-slip treatment on the sloped floor. I conked my head on the overhead ceiling when I slipped and caught myself before falling. This hotel was the highlight of our UK vacation. The staff was friendly and very helpful. We had pleasant interactions with all the staff we encountered during our stay. 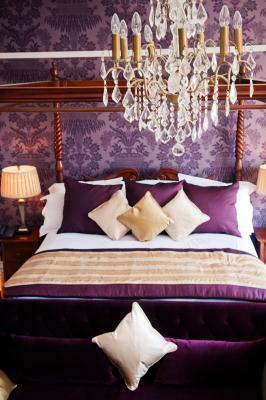 Our Duchess Suite was beautiful, spacious and luxurious. The views of the mainland of Wales were amazing. We enjoyed exploring the Chateau and the grounds. 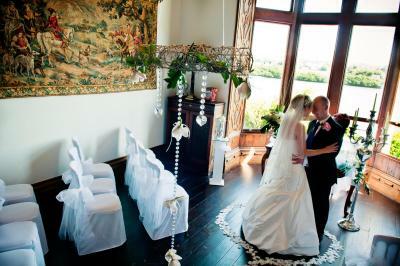 Picturesque location, beautiful hotel lounges and grounds that are well maintained. The staff were very kind and helpful. Beautiful old house with all the old charm left in the house. Interior was spectacular. We were upgraded to better room. The comfort level was great. Food was awesome. The staff were very helpful. 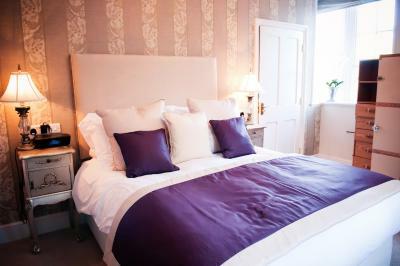 Fabulous staff, large, comfortable room, amazing bathroom, excellent food! 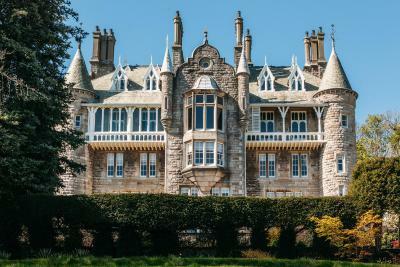 Château Rhianfa This rating is a reflection of how the property compares to the industry standard when it comes to price, facilities and services available. It's based on a self-evaluation by the property. Use this rating to help choose your stay! 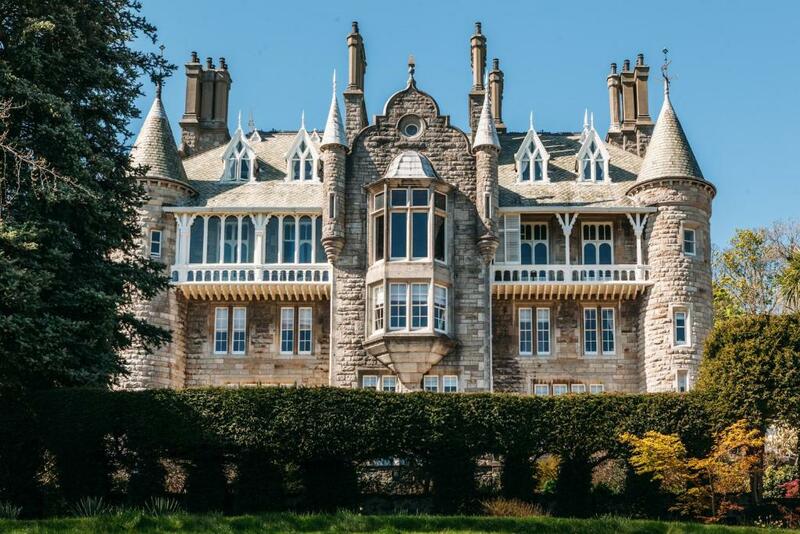 One of our top picks in Menai Bridge.With a private beach and panoramic views over the Menai Straits, Château Rhianfa is set in a Grade II listed Victorian villa. A tennis court, sauna and hot tub are available for guests to enjoy, as well as a wine cellar with wine tasting experiences. 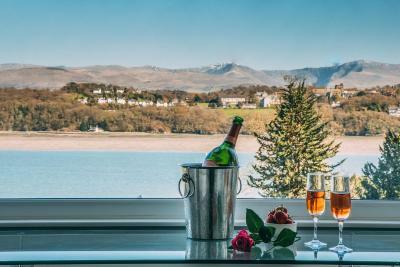 Enjoy outdoor dining overlooking the Menai Straits and Snowdonia National Park, or wander through Château Rhianfa's picturesque gardens and 3 acres of grounds. 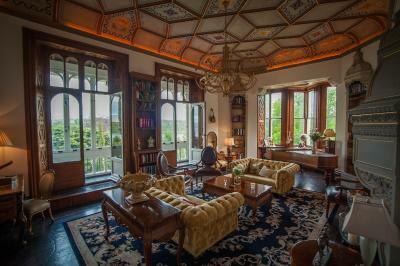 Period features such as wooden floors, paneled walls and painted ceilings are still visible. The on-site restaurant, Le Dragon Rouge, serves Welsh and French cuisine. A lounge menu until 17:00 is also available. 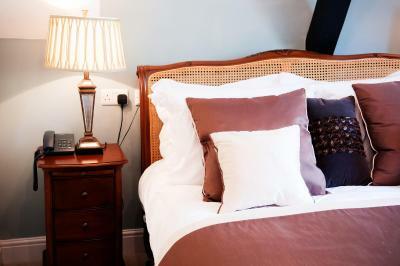 Free Wi-Fi and a luxury private bathroom are provided for each room, as well as tea/coffee making facilities. 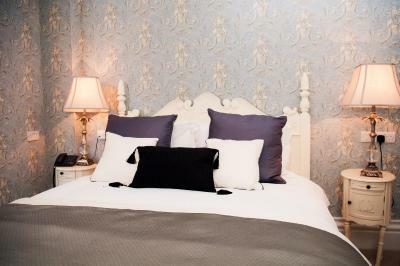 Suites, as well as apartments and cottages with kitchen facilities, are also available. 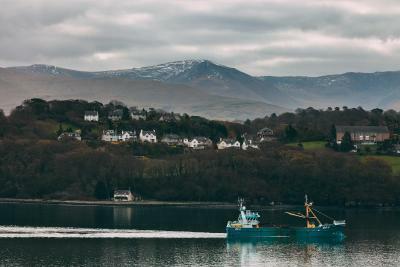 The entrance to Snowdonia National Park is just 15 minutes’ drive away, with Bangor city center and Beaumaris just 3 miles away. 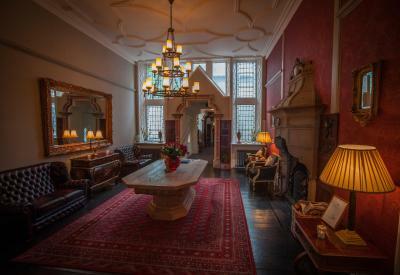 When would you like to stay at Château Rhianfa? 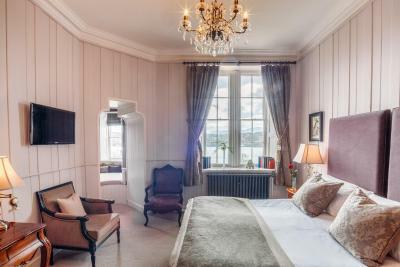 With sea and mountain views, this room also features free Wi-Fi, a luxury private bathroom, and a king-size bed. 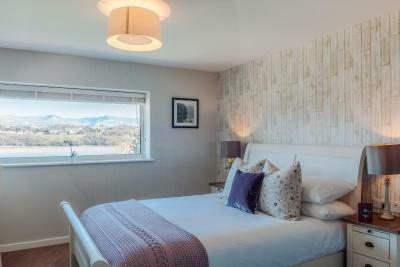 This room features views overlooking Snowdonia, free Wi-Fi and a luxury private bathroom. These rooms feature free Wi-Fi and luxury private bathroom. 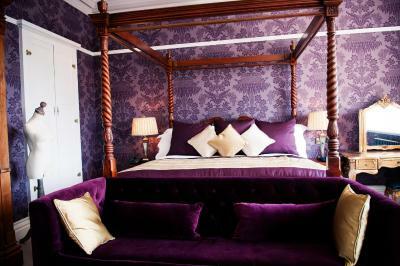 These suites feature sea and mountain views, either a king-size bed or twin beds, and an private bathroom. 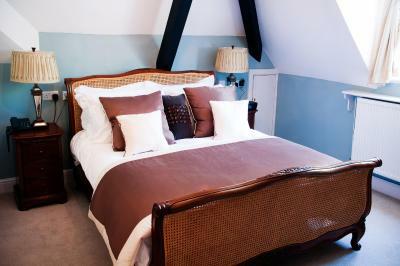 This former coach house has 2 en-suite double rooms, and a double room with bathroom across the landing. 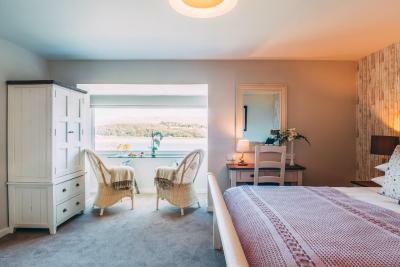 It features a large lounge with a log fire and sea views, dining room, and well-equipped kitchen. 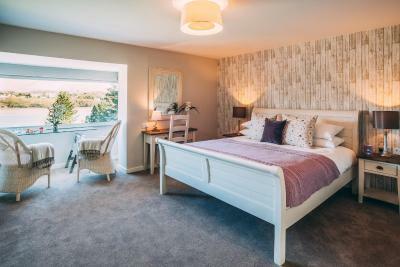 Set in the Gate Lodge within the estate, this apartment has 2 large bedrooms with attached bathroom. There is an open plan lounge and kitchen with a breakfast bar, oven, toaster and a fridge. There is also Freeview TV and complimentary toiletries. 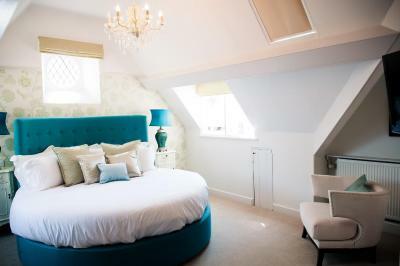 Housed in the estate's former stables, this luxury apartment has a large bedroom and a slate-finished shower room. 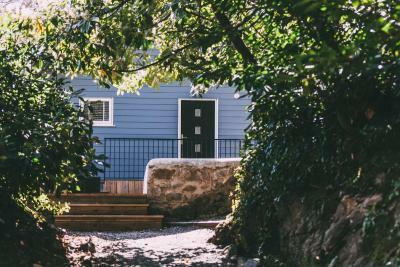 There is a lounge and dining room with sea views, as well as a kitchen with a breakfast bar, oven, toaster and a fridge. There is also Freeview TV and complimentary toiletries. 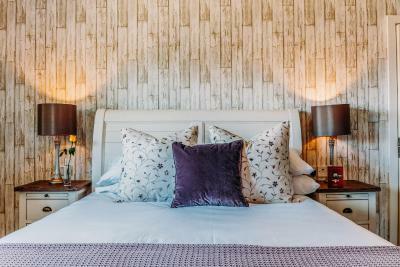 Located 200 yards from the main Chateau in the Rhianfa Lodge, these double rooms feature a color palette of blues, grays and white, with wood paneling. 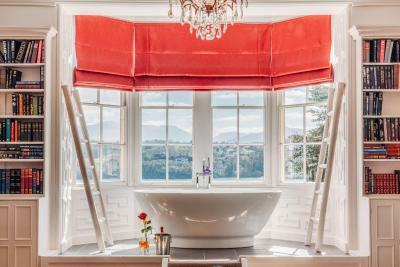 Located 200 yards from the main Chateau in the Rhianfa Lodge, this suite features a bay window overlooking the Rose Garden and Menai Straits, a king-size bed and a roll-top bath in the private bathroom. 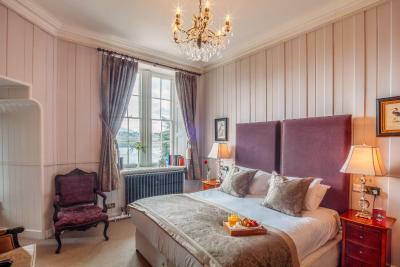 Located 200 yards from the main Chateau in the Rhianfa Lodge, these double rooms feature a color palette of blues, grays and white, with wood paneling complete with views over the Menai Straits and Snowdonia. 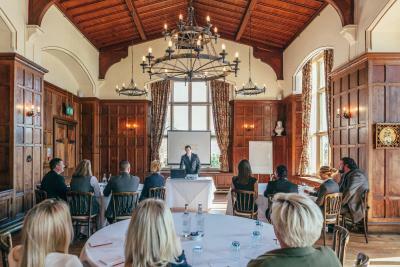 House Rules Château Rhianfa takes special requests – add in the next step! Château Rhianfa accepts these cards and reserves the right to temporarily hold an amount prior to arrival. Please note that Le Dragon Rouge Restaurant serves evening meals from 18:30 to 21:00. 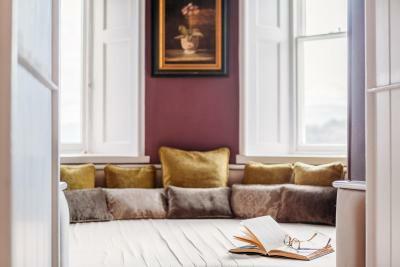 It is recommended that guests book a table in advance of their stay. Special diets can be catered for with prior notice. 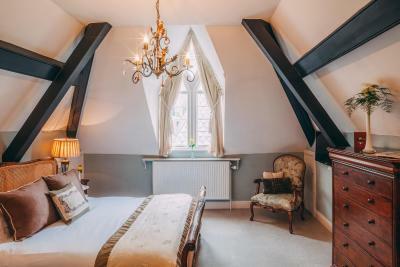 Please be aware that bookings made for the Lodge rooms will be in the Rhianfa Lodge, a separate building from the main Chateau with access along a garden path with some steps. We stayed in one of rooms the Lodge, which was lovely. Far exceeded our expectations however, could be a little noisy at times. Didn’t impact on our experience at all though, still had a lovely time. The staff were lovely and the hotel was stunning. Not as nice as I was expecting. Decor was a little tired and very expensive. Location, atmosphere and the setting was beautiful. The property needs a lot of maintenance as there was a leak from the ceiling in the living room by the front window and a large leak from the ceiling just outside the downstairs toilet . The floor and carpets could be cleaner . The balcony outside the bedroom was dirty and we could not use it for the purpose of sitting and relaxing . The kitchen has very few dishes and most pots and pans need replacing . Needs more cutlery and cups though there are enough plates . No parking for disabled by the front of hotel. Spacious property . Nice beds , secure and close to places of interest. The view from the living room was picturesque and very relaxing . Limited parking by front but has extra parking up the road and to the side of property. Has a kitchen , dish washer and washing machine which was very useful with young family . 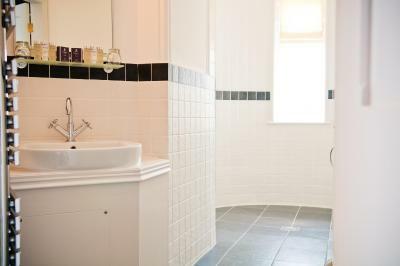 Has a Waitrose nearby and Morrison at Bangor for daily amenities. 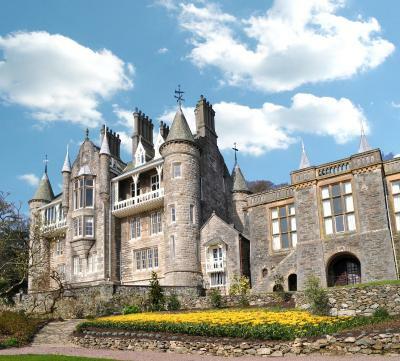 It’s close to touristy places such as beaches , welsh railway ,hidden gardens . Also within driveable distance from Llandudno and Portmeirion. Has a maid service but not on Sunday . We found there to be too many stairs. In certain areas of the building we thought it looked a little tired. The location was perfect. The breakfast was very good and the staff very friendly. Beautiful gardens and we were in luck we had excellent weather. We were not accommodated in the room we were expecting and the bathroom of said room was wholly unsatisfactory in terms of our needs and of hygiene. The shower had a constant drip, the fan was inadequate for the size of bathroom and one of the bulbs wasn't working (perhaps it had just blown). The lampshade in the bedroom was broken. 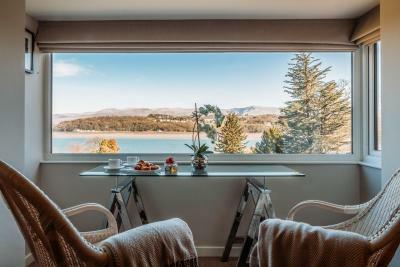 The view from this room was through a small window (although larger windows were on the upper floors of the Lodge) and could not be enjoyed by anyone who was in a wheelchair (disappointing since this is the disabled suite!). The intriguing little Cave bar would be more popular if the brick walls were sealed properly so that the dust didn't constantly drop onto the chairs and tables. In the absence of this treatment, bar staff need to hoover regularly all the skirtings/nooks and crannies and accompany guests to their seats armed with a duster and cloth to ensure their clothes don't get covered in the white dust. The staff need management to invest in the details of this great asset so they are not put in the position of having to make amends. With this wonderful Chateau comes responsibility and I just feel that it's lacking full commitment. 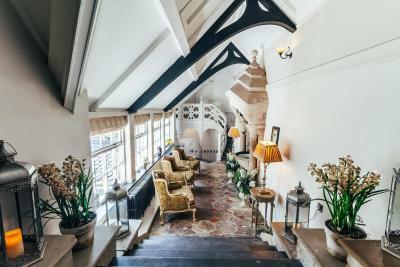 This is an incredible building with outstanding views, beautiful gardens, magnificent lounges, cosy corners, friendly, hard-working staff and excellent food. Despite a problem with our first room (see below), the receptionist did everything she could to make amends. We were reassigned a magnificent room so thank you so much to our thoughtful receptionist. The double bed was two singles badly put together and came apart in the night which resulted in a poor sleep for both of us. I was exceptionally disappointed when I gave feedback to the lady on reception and hen checking out. Total lack of interest and therefore I felt it pointless to give any more feedback. Brakfeast order from the night before had been lost.i had to call reception to enquire where breakfast was. When it was delivered there was no apology or acknowledgement of it arriving almost an hour late. The welcome tray had not been replenished from the previous guests,only one coffee sachet and two t bags in the tray. The ‘double’ bed was two singles pushed together which resulted in a very disappointing nights sleep. Superb historic property. Excellent restaurant,compliments to the chef and the young Man who served us,exceptional standard. 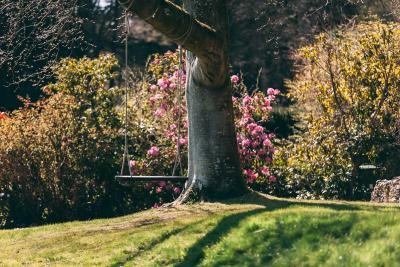 Great location,lovely private gardens and the location was ideal. Sort the bloody WiFi out. Very in-and-out. All good. Staff extremely helpful. Food outstanding. 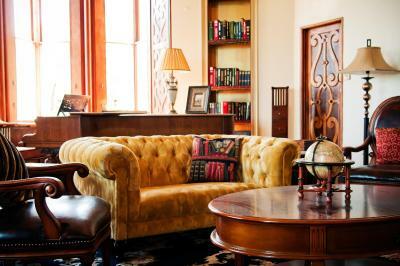 Eccentric property with its chateau themed furniture and decor . Warm and homely feeling . Hot water and clean towels. Service in dining room was slow. Our used dishes were left on table. Lifts between floors would help. 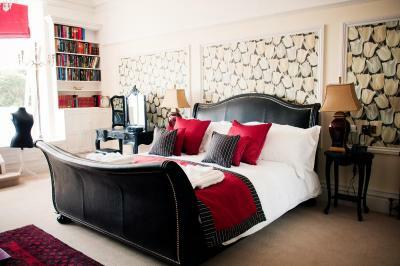 I was disappointed that after ringing hotel on returning home to let you know I had left two books behind which I didnot want to lose the man I sloke to told me he would check with cleaning staff and get back to me, he didn't so I rang again today and spoke to a female member of staff who promised she would do the same. Neither returned my call. I can do without books if they have not been found but would appreciate the courtesy of a returned call. The decor and furnishing The food was excellent. The location wonderful. We booked the hotel to use the hot tub facilities. After climbing Snowdon for 8 hours we were really looking forward to using the hot tub but it was broken. Really disappointing. Really interesting place to stay! Lovely to stay in a different type of hotel. Breakfast was very good. Great views and close location to the beginning of Snowdon climb. I went to bed hungry with no dinner after waiting an hour and a half for our food. Our table reservation was not honoured. The walls were dusty. The lights didn't work. The whole place was understaffed. 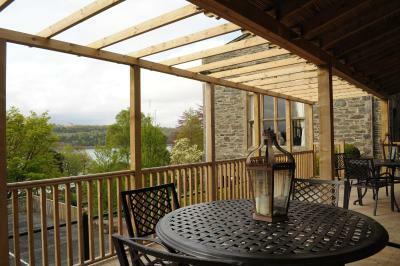 The location is brilliant with excellent views. Beautiful location, stunning building and superb food. The staff were excellent and always smiling. Room was lovely (Plas Suite) with very comfortable bed, the L'Occitane toiletries we a nice touch of luxury.